1. Download and install TweetMyPC software application. Goto Twitter.com and make an account for your computer. You can use this account to shutdown, restart or logOff your computer remotely by sending a tweet. 2. Start TweetMyPC application on your computer and enter Twitter login details of account created for your computer. To shutdown, restart or logOff computer remotely – login into PC’s Twitter account and send tweet like: Shutdown, Restart, Logoff (Commands are Case Sensitive). 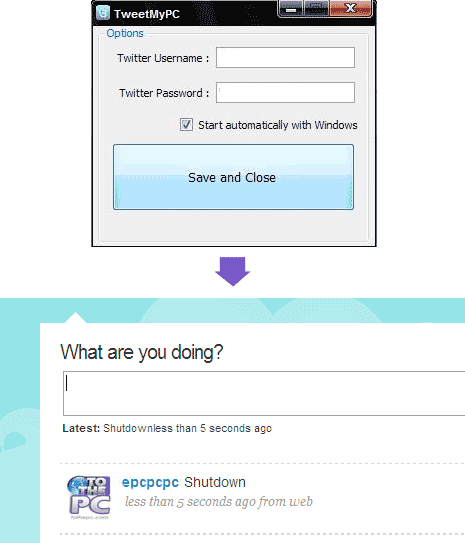 Of course, you can login into PC’s Twitter account from any computer and shutdown, restart, logOff any computer with TweetMyPC installed and logged in PC’s twitter account. Power of Twitter to do things remotely, intelligent and very easy to use application.